Utah Valley University, or UVU, is a publicly funded university located in Orem, Utah, United States with a Fall 2016 enrollment of 34,978 students. Utah Valley University is the largest public university in the State of Utah. The university offers approximately 58 bachelor's degrees, 66 associate degrees, 21 certificate/diploma programs, and 8 high-demand master's degrees in education, business, nursing, accountancy, computer science, cybersecurity, public service, and social work. The university’s Wasatch Campus in Heber City, Utah, also offers bachelor's degrees in business management and secondary education, as well as associate degrees in accounting, behavioral science, business management, elementary education, and general education. 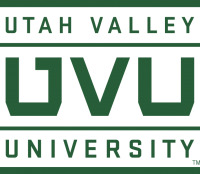 Previously called Utah Valley State College (UVSC), the school attained university status in July 2008, changing to Utah Valley University. Matthew S. Holland, appointed as the first president of UVU, officially began his duties on June 1, 2009. NOTE: CosmoLearning is not affiliated or endorsed by Utah Valley University. This page is only intended to credit this content provider for their educational content being included on the CosmoLearning site.